In early October, the Intergovernmental Panel on Climate Change (IPCC) published a special report  titled Global Warming of 1.5˚C, highlighting the dangers of a 1.5˚C increase in the Earth’s average surface temperature over pre-industrial times. The report suggests that as things stand, we will reach this extent of warming between 2030 and 2052. At present, we have already banked in 1 degree (and possibly up to 1.2˚C) of this rise, and the dangers of further increases are well-documented – not just in this most recent IPCC report, but many others in the climate change literature as well. A brief summary of some of the expected damages of intensifying climate events pertinent to the context of Malaysia can be found in an article  I authored in January. The scientiﬁc consensus over the dangers of a 1.5˚C rise in temperatures makes for grim reading, let alone those of a 2˚C increase. The extent of the policy commitments required to stave off the worst of climate change is even more sobering; even a global fulﬁlment of the nationally-determined emission reduction pledges as per the Paris Accord would still likely see temperatures rise by between 2.6 and 3.2˚C, at best, by 2100 . At the same time, evidence suggests that most countries will fall short of meeting their pledges – for some, the gap is considerable. Malaysia, for example, lacks strong policies necessary to transition to a low-carbon economy, although recent announcements on the subject made by the Pakatan Harapan (PH) government are encouraging. This paper will focus on two key areas responsible for over half of our emissions, namely electricity generation and transport; discuss the steps taken to mitigate emissions within these sectors thus far; and highlight several key policy directions that may signiﬁcantly curtail these emissions and strengthen the foundations of future climate action in the country. Electricity generation contributes most to Malaysia’s greenhouse gas (GHG) emissions. Between 1990 and 2011, emissions from this sector increased by over 465%, from 20.14 MtCO2e to 113.87 MtCO2e . To put this growth rate into perspective, fugitive emissions from oil and gas operations, the second-fastest growing source of domestic emissions over this time period, saw a growth rate of “just” 349.6%. 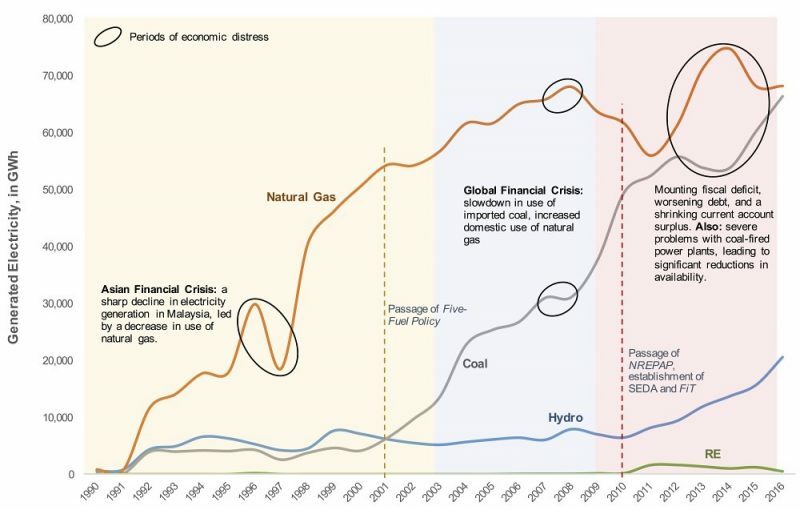 In the 1990s, the rise in emissions from electricity generation was the result of fast-growing demand being met by an increase in the consumption of natural gas. Since the early 2000s, growth in the demand for electricity has largely slowed, and gas has been phased out in favour of coal. This last step was taken to reduce the nation’s reliance on domestically-produced natural gas, whose reserves are projected to last only for another 45 years . The share of coal in electricity generation has, as a result, swelled from 6.3%  at the turn of the millennium, to a shocking average of 57.4%  between April 1 and October 15. Running concurrently to these twin developments is the seemingly contradictory rhetoric around sustainability and renewable energy (RE). The 2001 Five Fuels Policy introduced RE as the nation’s “ﬁfth fuel”, after oil, hydro, natural gas, and coal; that same year, the Small Renewable Energy Power (SREP) programme, was launched. Unfortunately, both policy and programme failed to achieve much of note. By the end of the SREP in 2009, RE contributed a mere 0.2% to Malaysia’s electricity generation capacity of almost 22,000MW [a]. In 2016, Malaysia saw another policy shift, with solar PV being phased out of the FiT, in favour of net energy metering (NEM). The outcomes of this policy, however, have been even more discouraging, due largely to a very weak incentivisation structure designed to protect the interests of the government-linked utility Tenaga Nasional Berhad (TNB). As of June, NEM had contributed an additional 13.56MW to the nation’s electricity generation capacity. The announcements by Yeo Bee Yin, the Minister of Energy, Science, Technology, Environment and Climate Change (MESTECC), on October 18  that NEM will be favourably tweaked to improve the incentives offered to consumers in exchange for generating and exporting electricity from solar panels, and that Malaysia will press on with a third auction for large-scale solar plants is welcome news. It is imperative that progress on the increasing deployment of RE in Malaysia is monitored over the coming years, and policies adjusted should they not contribute efﬁciently and signiﬁcantly to the greening of electricity generation. As of today, however, the country’s RE share of electricity generation is under 3% which explains why Malaysia is among the nations falling short of meeting the pledges it made to the UNFCCC in 2015 . Transport is the second-largest single contributor to GHG emissions in Malaysia, accounting for 65.5 MtCO2e in 2014, for a share of total emissions of 20.7% . This is highlighted in Figure 2, which also reveals that in absolute terms, transport-sector emissions have doubled between 2000 and 2014. Much of this increase is driven by fast-growing motorisation rates; Malaysia ranks ﬁrst on this metric among South-East Asian nations, with 439 vehicles per 1000 inhabitants in 2015 . Inexpensive locally-produced cars and inadequate public transportation networks are also contributing factors, as is an expensive and inefﬁcient subsidy for petrol. While it deserves a separate argument of its own, the subsidy on petrol should be re-examined by the relevant Ministries, and a roadmap to its removal should be drawn up. Given that we currently sit at the dawn of the electric vehicle (EV) age, the PH government has reason to disincentivise the consumption of petrol – and cut distortionary spending. While there are numerous avenues through which transport-related emissions can be signiﬁcantly curtailed, three stand out. The ﬁrst of these are improvements to the accessibility, reach, and use of public transport options across Malaysia; emissions per passenger-kilometre are lowest with public transport, but highest for private, single-passenger cars . Densely populated areas of Malaysia need to be well-serviced with buses and trains; and smart investments made to expand public transport networks across the country, including last-mile connectivity. Increasing rates of switching, from private road transport to shared public transport, will contribute to transport emissions reductions and decrease road congestion [c]. Source: World Resources Institute: Climate Analysis Indicators Tool. Second, the weaknesses of the existing Energy Efﬁcient Vehicle (EEV) policy must be addressed, and concurrently, the relevant Ministries should consider the implementation of mandatory fuel economy standards. It is important that the Ministry of International Trade and Industry (MITI), as part of its review of the National Automotive Policy, increases the stringency of the EEV policy. At present, the fuel economy ratings required for EEV status are far too lenient to ensure any tangible environmental returns. Fuel economy standards would represent a natural step up from the voluntary EEV scheme for the simple reason that they are mandatory. Implemented in numerous nations across the world, including China, Japan, and South Korea in Asia, as well as the EU and the US, such a policy has the potential to play a pivotal role in mitigating emissions associated with petrol-powered private road transport in both the short- and medium-run, through the development and application of efﬁciency-enhancing technology by automakers. The rationale is simple: new vehicles not meeting the required fuel economy standards will be disallowed from being sold on the Malaysian market. Instead, new vehicles sold by automakers will largely exceed the minimum fuel economy stipulations, leading to reductions in vehicle fleet emissions over a counterfactual scenario where fuel economy standards are not utilised. 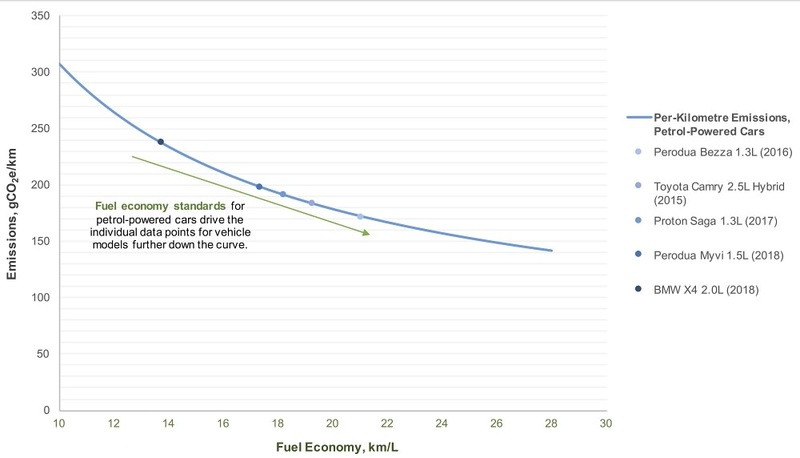 This logic is highlighted in Figure 3; fuel economy ratings for individual vehicles are inversely related to per-kilometre (and consequently lifetime) emissions. The higher the fuel economy, the lower the emissions, and the greater the reduction in emissions from the transport sector [d]. Source: Data from Joshi (2018b). Finally, the mass-adoption of EVs in the longer-run has the potential to dramatically restrain private road transport emissions – under speciﬁc conditions. In a recent paper , I argued that under our current, fossil fuel-reliant electricity generation mix, EVs are on average more polluting than conventional petrol-powered vehicles. It is only as the share of RE in electricity generation exceeds 30% that EVs are cleaner. At even higher shares of RE, EVs considerably outperform their petrol-based competitors from the perspective of climate action. This is another reason to push strongly for a greater share of clean energy in power generation; the environmental beneﬁts will spill over to other sectors, and contribute greatly to a greening of the wider Malaysian economy. With effective policies that emphasise RE and public transport, and set the foundations for a medium- to long-run electriﬁcation of Malaysia’s vehicle fleet, our country would be in a strong position to signiﬁcantly mitigate the climate impacts of two key sectors responsible for over half of our total GHG emissions. Sector-speciﬁc action aside, the latest IPCC report’s rallying cry to policymakers is exactly the same one they have had since the Panel was formed in 1988: to put a price on carbon. Back in 1997, over 2,500 economists, including eight Nobel laureates, attached their names to the Economists’ Statement on Climate Change, suggesting that “the most efficient approach to slowing climate change is through market-based policies […]nations can most efficiently implement their climate policies through market mechanisms, such as carbon taxes […] revenues generated from such policies can effectively be used to reduce the deﬁcit or to lower existing taxes” . Economists do not generally agree on much, yet with a carbon tax, there is an almost perfect consensus. Yet despite the theoretical evidence, a “carbon tax” is deemed both politically and socially contentious [e]. In reality however, its potential beneﬁts are too numerous to discount. [A more detailed expression of the economic argument underlying the implementation of a carbon tax can be found in the Appendix]. Most importantly, a carbon tax addresses the negative externality of carbon emissions, by forcing polluters to acknowledge the environmental costs of their actions. In addition to causing emissions to re-optimise at a lower level, a carbon tax levels the playing ﬁeld between fossil fuels and RE. A virtuous cycle then plays out: as the tax causes the levelised cost of electricity (LCOE) generated from fossil fuels to rise, RE becomes relatively cheaper, and the industry will draw greater investment. This drives RE costs down even further, and brings forward the achievement date of grid parity. These, however, are just the direct effects of a tax on carbon. The indirect beneﬁts, derived through use of the revenues of such a tax, could be more consequential still. Consider a situation where all the CO2e emitted through generated electricity from coal and natural gas power plants in 2016 was taxed at RM30 per ton [f]. That year, natural gas generated 67,942GWh of electricity, and coal 66,246GWh. Using estimates of the median emissions intensity of various electricity supply sources published by the IPCC, which amount to 490gCO2e/kWh for combined-cycle natural gas plants and between 820 and 1,001gCO2e/kWh for coal plants, a total of between RM2.63bil and RM3.04bil would have been raised in revenues from a carbon tax in 2016. This is a large ﬁgure considering the narrow scope of a tax which targets just two fuel sources within the electricity generation sector; a broadened tax which taxes the lifecycle emissions associated with electricity generation, as well as the heavy industry, manufacturing and construction, transport and waste sectors would more than double this ﬁgure to around RM7bil. In doing so, a large proportion of Malaysia’s GHG emissions would be covered by a single policy framework, and reductions in pollution would occur across the economy-at-large. To aid the consistency of these revenue estimates, as well as to gauge the impact of a particular carbon tax rate on the LCOE of fossil fuels used in electricity generation, it is imperative that efforts are made by the government, and by MESTECC in particular, to ensure that power producers are transparent about the emissions intensities of their technologies and the costs they face in their generating of electricity. Such a move would allow for more accurate forecasting of the impacts of a carbon tax on electricity markets and prices; grid parity for renewables; emissions reductions; and the scale of the revenues which can be reinvested to support other important state- and federal-level initiatives. There are numerous ways through which these revenues can be utilised. The ﬁrst and most obvious of these is through providing a regular source of funding for climate change mitigation and adaptation policies, such as the aforementioned FiT and NEM mechanisms, as well as addressing the market failure inherent in research and development (for RE)16. Second, these revenues can assist the PH government in meeting the shortfall in revenue from the abolishment of the Goods and Services Tax (GST), as well as alleviating the burdens of Malaysia’s current budgetary crisis. Third, the government’s ability to invest in public infrastructure would be improved, beneﬁtting the Rakyat as a whole, while a portion of these revenues could be used to fund policies and programmes targeted towards those in the B40 group speciﬁcally. With just one policy, wins for the environment and sustainability can be achieved, with spill overs positively affecting the Rakyat – and the B40 group in particular – as well as government coffers [g]. For all these reasons, there is a strong argument for a carbon tax; it can set solid foundations for policies that address sustainability; assist in the mitigation of climate change; and redistribute wealth away from polluters and towards society at large. Its implementation is vital for the sake of the nation’s medium- to long-run welfare in the face of climate change, and to put an end to what is essentially an inherent subsidy to Malaysia’s biggest polluters. Climate policy action is costly in the short-run, but climate policy inaction will very likely be costlier still, in the medium- to long-run. From an economic perspective, the pricing and taxing of carbon represents an efﬁcient solution to two signiﬁcant market failures. GHG emissions are a side effect of otherwise productive activity, like the burning of coal to produce electricity, and represent a negative externality. At the same time, these GHG emissions are causing climate change, primarily through the impact of emissions on temperature, which will in turn cause signiﬁcant economic damage to almost every nation moving forward. The emitting of GHGs, therefore, is not a costless action. Economic theory predicts that these negative externalities will be “oversupplied”, since their full costs are not internalised by emitters. Without a price on carbon, emitters are not forced to consider the impact of their releasing GHGs into the atmosphere, and contributing to the issue of climate change. This gives polluters no tangible incentive to mitigate emissions, and is a major factor behind the rapid increase in GHG emissions since the Industrial Revolution. Compounding this issue further is the fact that our planet’s atmosphere is a shared global resource: it is the largest “public good” on Earth. Public goods are considered “non-rivalrous”, meaning one individual’s access to a resource does not infringe upon another’s access to the same resource, and “non-excludable”, meaning no one individual can be prevented from accessing said resource. In the absence of regulatory action or policy, public goods are theorised to be overexploited. This is because the conservation of public goods is in no one individual’s rational self-interest: if I can use something for free, and I derive a beneﬁt from it, why should I curb my consumption (of it)? The atmosphere represents the quintessential public good. Uncontrolled increases in carbon emissions, analysed through the lens of market failures, are entirely unsurprising since individual actors do not face the true costs of their contribution to the mix of pollutants in the atmosphere, and consequently their contribution to climate change. The fundamental policy prescription to alleviate these issues of oversupply (of GHGs) and over-exploitation (of the atmosphere) is to put a price on carbon emissions. If GHG emissions were priced to reflect their full cost to the environment, emitters and consumers alike would be forced to re-optimise their proﬁt- and utility-maximising behaviours to account for the costs of their emissions and the costs of their contribution to climate change. This “internalisation” of the cost of the externality would force ﬁrms, consumers and even nations as a whole to settle on lower emissions levels, as in some cases, the tax would be signiﬁcant enough for them to switch to less carbon-intensive activities instead. isn’t), but we are essentially completely disregarding the environmental beneﬁts of utilising RE technologies over more polluting alternatives. We are not putting a tangible value on the fact that clean energy is capable of mitigating some of the future costs of climate change. This is a poor approach to take, especially for a country which purports to place much emphasis on sustainability. This enormous inherent subsidy afforded to fossil fuels must be reversed for Malaysia to truly embark on the process of decarbonising the national economy. The pricing and taxing of carbon emissions thus represents a critical ﬁrst step towards optimising between carbon-driven economic productivity and carbon-driven environmental degradation. An accurate price on carbon would in theory cause an efﬁcient, economy-wide re-optimisation of GHG emissions that accounts for both the productive economic, and harmful environmental, potential of carbon. But what should the price of carbon be? This price is typically referred to as the social cost of carbon (SCC), and reflects to the best of scientiﬁc and economic knowledge the costs of the damage caused by an incremental ton of CO2e emitted into the atmosphere in a particular year. Given the generally high level of uncertainty around aspects of climate change and its effects, calculating the SCC involves several extremely complex steps. The ﬁrst of these requires modelling trajectories of numerous socioeconomic factors, including but not limited to population, GDP, and energy use, in order to estimate GHG emissions over a particular time horizon. These emissions, and consequent changes in the atmospheric concentration of GHGs, are used to predict changes in temperature. Temperature changes are translated into estimates of economic damages over the selected period of time. Finally, future damages are discounted to reflect their present value in any given year. It is clear that the process of deriving as accurate an SCC as possible is no simple feat. In the context of Malaysia, a tremendous amount of research is still required in order for us to understand just how damaging our decisions and actions are likely to be for current and future life in the country. We need a better understanding of the localised effects of temperature increases on the different components of the economy, and to be able to predict with some conﬁdence the quantitative extent of these damages over time. As research gaps in the study of the impact of climate change on the Malaysian economy are ﬁlled, our ability to derive an ever more accurate price of carbon for Malaysia will grow. Such a price will allow policymakers to impose, eventually, the ideal climate policy: a one-time fee on carbon emissions that forces a re-optimisation between carbon-driven economic growth, and carbon-driven environmental degradation, based on the expected damages of climate change to Malaysia. While it will take time and considerable effort to derive this most perfect of prices, there is no reason to put off the implementation of a policy measure which utilises a carbon price. It is, and has been for a long time, undeniably clear that carbon emissions are causing climate change, and it is just as undeniable that climate change will be economically damaging. Carbon emissions are not costless; the price of carbon is therefore strictly greater than zero. If we want to create, and live in, a sustainable world, we need to start taking concrete account of the economic elephant in the room: the carbon externality. [a] A detailed discussion of the SREP is provided by Sovacool & Drupady (2011). [b] The Renewable Energy Fund (REF) was launched concurrently to the FiT, and serves as the tariff’s financing fund. [c] Traffic congestion is also found in numerous studies to have negative impacts on productivity and consequently, economic growth. [d] Assuming non-positive changes to vehicle fleet size. [e] Not to mention that any push for carbon taxation will have to address and overcome resistance from politically and financially powerful fossil fuel-linked interests. [f] This figure conforms closely to the “country-level social cost of carbon” for Malaysia, as calculated by Ricke et al (2018). [g] Technically speaking, there are benefits for economic and social efficiency as well. The “oversupply” of carbon emissions, owing to the lack of a carbon price, acts as an excessive social cost. Taxing carbon removes the deadweight loss associated with this excessive social cost by forcing emissions to re-optimise to a lower, socially-conscious level. Stavins, Robert N. 2011. “Repairing the R&D Market Failure”. Environmental Law Institute: Washington, D.C. Available at https://scholar.harvard.edu/files/stavins/files/column_40.pdf.